These are the times …. Lost of human life is never something to celebrate. When is it revenge and when is it justice? Aren’t all allowed Grace? That being said, he did evil. I’d go as far as to say he was evil. The judging side of me says that he got what he deserved. The lives of many men, women and children – innocents – were murdered because of him and his plans. So, with all my allowance for humanity there is also relief, that after 10 years, justice is served. Otherwise, I have no personal feelings on the matter. In other news, I am quite fascinated with the online coverage and the story of the man who tweeted the raid without even realizing it was the raid. Yes, it was Twitter that first broke it for me. And, in other, other news …. isn’t it an interesting time to be living on the earth? In one weekend we have a royal wedding and the modernization of the royal family – a legacy that has been alive for years – as well as the capture and death of America’s most wanted – after 10 years of searching. Both of which were broadcasted, within SECONDS, online. Anyone who follows me on Twitter will know that I think the twitterverse is spending too much time following Charlie Sheen’s antics and not enough time on the important matters. 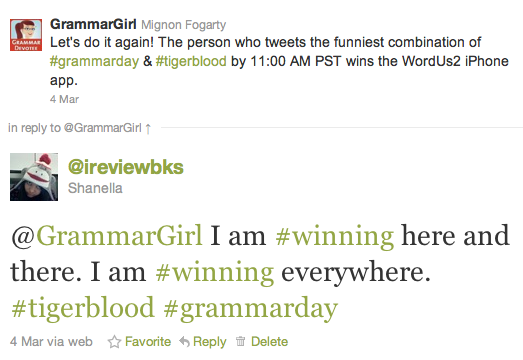 However, when Grammar Girl had a twitter contest on Grammar Day incorporating Charlie Sheen, I couldn’t pass up the opportunity to win the WordUs2 iPhone game. With a little bit of help from the good Doctor Seuss, I managed to win! Green Eggs and Ham anyone? The point of all of this is, I won, then I downloaded the game, then I played it, thought it was silly. Then gave it a second chance and now I’m hooked. I LOVE IT! I managed to grab some screenshots of the game from my iPod, so I’ll try my best to explain the rules. You’re given words (in this case a 5 letter word that begins with C) and you have to try to guess the word. 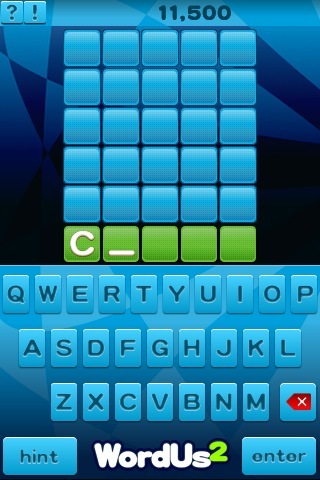 I’m playing the Calm and Collected mode so you have unlimited attempts to guess the word. Once you make your word and hit Enter, it lets you know whether your word is the correct word or has letters that are in the correct word. If the tile is Orange, it means the letter is in the correct place. If the tile is Blue it means the letter does not belong to the word. If the tile is yellow, it means that the letter is in the word, but not in the correct place. Once you guess the word, all squares will be orange and it takes you on to the next word. It’s helpful, especially for people who like to play Words with Friends (or Scrabble). Tomorrow I will be tweeting from stops and maybe posting pictures on twitpic. Watch the sidebar for updates or follow along on my twitter account.